If you’re reading this, it’s probably because you know that a wave of exciting new large-sensor cameras is upon us, each more affordable than the next. You’re wondering, should I buy one of these things? Is now the time? The convenience of camera ownership, after all, is what drove low budget filmmakers into the hands of DV a decade ago, followed by HDV, P2 and the ubiquitous HDSLR. Before digital wizardry, choices were simpler: Super 8mm, 16mm or 35mm? Let’s briefly invoke this classic taxonomy to better understand the latest developments. Super 8, with its toy cameras, easy cartridges and endless depth of field, always spelled fun. Super 8 corresponds to today’s HD-enabled cell phones and Flip cameras — any device with a 1/4-inch sensor or smaller. (Go here to see an iPad 2 music video shot by “iPad-ographers”). 35mm was, and is, pure cinema. Its invention gave rise to motion pictures on the big screen. It directly inspires the new digital cameras described here, with large single sensors the size of standard Academy Aperture 35mm or Super 35. While Kodak took 30 years to scale 35mm down to 16mm, CCD camcorders evolved in the opposite direction, starting with 1/3-inch and 2/3-inch sensors in the 1980s and culminating a quarter century later in Panavision’s Genesis and Sony’s F35, each boasting a Super 35-size CCD from Sony. The imposing costs of these and other pioneering $100K+ large-sensor cameras provided an opening for the $17K RED One, with its game-changing Super 35-sized CMOS sensor, 4K image capture and PL mount lenses. RED’s success — nay, celebrity — in turn set the stage for the viral popularity of $2.5K HDSLRs, whose images are often indistinguishable from their high-end antecedents. The modest theatrical success of indie films such as Lena Dunham’s Tiny Furniture, shot with a Canon 7D HDSLR by the talented d.p. Jody Lee Lipes, is a case in point. On the big screen, it looks every inch a work of cinema. Back where we started, at long last? You may have heard, correctly, that digital SLRs acquired HD capability after large news organizations pressed Japanese manufacturers on the issue. Why shouldn’t photojournalists in faraway war zones, they insisted, double as videographers when needed? It’s important to understand that HDSLRs are first and foremost still cameras. Design, ergonomics and functionality answer to the needs of still photographers. In order to use cine PL lenses, for instance, HDSLRs such as Canon’s EOS 5D Mark II and EOS 7D must have their movable mirror extracted and a custom PL mount attached, the machining of which is expensive and voids warranties. Viewfinder? Canon’s EOS 5D Mark II and EOS 7D provide live view from a small, rear-facing LCD that can’t be angled or repositioned. You can attach an independent HD monitor or viewfinder by HDMI, but the live image doesn’t entirely fill the screen due to conflicts between HD’s 16:9 aspect ratio and the HDSLR’s native 3:2 aspect ratio. Only upon playback is a full 1920 x 1080 image available. More troublesome is the fact that the 12-, 16-, 18- or 21-megapixel sensors in these HDSLRs must somehow contrive a 1920 x 1080 HD image made up of only two megapixels. But isn’t oversampling the original image a good thing, you ask? Yes, but that’s not what happens here. Instead of using an excess of active pixels to create a super-detailed subsample for HD use, HDSLRs do the opposite. They simply throw away every two or three horizontal lines of picture, which results in the 1080 horizontal lines needed for HD but also picture sampling at a reduced vertical frequency. 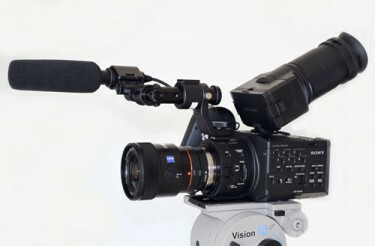 Video camera manufacturers such as Sony and Panasonic have recently awakened to a growing hue and cry for 35mm-size sensors in true video products: camcorders with real viewfinders, XLR audio inputs, traditional controls like gain and white balance and most critically, an item most people are hardly aware of: an effective optical low-pass filter (OLPF). An OLPF is a glass filter inside every digital video camera, mounted just in front of its sensor (or sensors), which is why you never see it. Its job is to blur the very finest bits of image, only those details smaller than the gaps between the sensor’s individual photo sites — detail that can’t be resolved anyway. This technique curbs moiré and “false color” flickering in moving shots. To prevent moiré in stills, the OLPF in an HDSLR is calibrated to blur image detail too fine for, say, its 21-megapixel sensor to resolve. But what filters out image detail too fine for the coarser 2-megapixel scan created for HD output? In HD images containing high-contrast horizontal lines or grids, the sad outcome is often ugly stair-step aliasing or a patch of strobing moiré that ruins the shot, as there is no fix in post. Brick buildings in daylight, anyone? As I said, HDSLRs remain, at heart, still cameras. The following, in order of street price (New York’s B&H), were mostly announced or sneak-peeked last year and are, or will be, widely available this year. Which is why 2011 is truly the year of the affordable large-sensor digital motion picture camera. 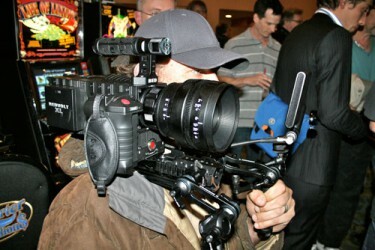 Or, as Steve Jobs might say, the cinema camera for the rest of us. These notes are introductory, not comprehensive. There’s plenty of info and opinion about these products on the Internet. Last May Sony announced the “world’s smallest and lightest interchangeable lens digital camera,” the NEX-5. It’s the size of a pack of cards, with a Super 35-size CMOS sensor (called APS-C size in the DSLR world), a new bayonet-style mount called E-mount and Full HD 1920 x 1080/60i (no 24p) capture to AVCHD using either Memory Stick PRO Duo or SDHC cards. Primarily a still camera, the NEX-5 ($700 with 18-55mm zoom) looks like a tiny point-and-shoot with a big lens on it. Technically it shouldn’t be called an HDSLR because it lacks an optical reflex viewing system, but losing the movable mirror allowed Sony to reduce the E-mount’s flange focal distance (sensor surface to face of mount) to a shallow 18mm, which translates into a minimal camera body. A few months later, in July, Sony announced the NEX-VG10, a compact palm-held camcorder — viewfinder in handle, LCD on side — with an oversize lens. Apart from the shape of the body, every specification is identical to the NEX-5 because on the inside it’s the very same camera. In addition to the lightweight E-mount zoom bundled with each camera, Sony introduced a wide-angle 16mm E-mount lens and promised more lenses to come — all featuring auto focus, auto exposure and optical stabilization. Sony also released an Alpha-to-E-mount adaptor to permit use of Sony’s growing line of Alpha DSLR lenses, many made by Zeiss. Because of E-mount’s shallow flange focal distance, conjuring third-party adapters for other SLR lens families is duck soup. Novoflex of Germany, for instance, already markets E-mount adapters for Canon FD, Contax/Yashica, Lexica, Nikon, Olympus, Pentax, Hasselblad and more. I mentioned NEX-5 first for a reason. Both cameras share a big CMOS sensor that boasts 14.2 megapixels. How do they fashion a 2-megapixel HD image? I found out the hard way filming an interview of Picasso biographer John Richardson in a Seattle auditorium in front of 2,000 people. In addition to a main camera, I placed an NEX-5 on stage right and a VG10 at the foot of the stage to capture additional angles. I just aimed them and let them run by themselves the entire time. Richardson wasn’t exactly wearing seersucker, but you’d never know it judging from the rainbow moiré that danced across his jacket. The VG10 produced this result. I wasn’t exaggerating when I said it was the same camera as the NEX-5. Same OLPF optimized for stills, not HD. All of the following large-sensor cameras incorporate OLPFs appropriate to their intended image formats. Overt moiré is not an issue with them. PANASONIC AG-AF100. PHOTO BY DAVID LEITNER. At NAB in April 2010 Panasonic intriguedpassersby with a diminutive prototype under glass resembling an HVX200 with the lens sawed off. The glass box came off late last fall and AG-AF100s began to filter into real hands. In a nutshell, the AF100 combines a CMOS sensor a tad smaller than Academy Aperture 35mm (known as the Olympus/Kodak Four Thirds standard in the DSLR world) with a Micro Four Thirds (MFT) bayonet mount that specifies a short 20mm flange focal distance akin to Sony’s E-mount. Effective pixel count for 16:9 is 12.4 megapixels, similar to the 4:3 16.05 megapixel density of Panasonic’s Lumix DMC-GH2 HDSLR. Again, I ask, why does a 2-megapixel HD image require such pixel density? A BBC crit of the AF100 explores the math here. Panasonic’s 14-42mm and 14-140mm kit zooms for the GH2 provide auto iris, auto focus and optical image stabilization when used with the AF100. Novoflex makes MFT adapters for the same SLR lens groups as their E-mount adapters, while Micro Four Thirds-to-PL mount adapters are available from Hot Rod Cameras and Solid Camera. The AF100 records to AVCCAM, Panasonic’s pro nickname for AVCHD (technically known as MPEG-4 AVC/H.264), using SDHC and greater-capacity SDXC cards. There are two slots for relay recording. All HD frame rates are supported including 24p, with variable frame rates up to 60p for slo-mo effects. 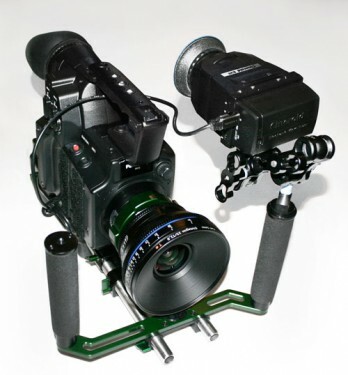 Nice touches include a generous pixel-free LCoS color viewfinder, ND filter dial, simultaneous HDMI and HD-SDI outputs (both 8-bit uncompressed) and, for on-location flexibility, a removable handle and side grip with three ¼-20 threaded holes for attaching stuff. Announced March 23, Sony again combines E-mount and AVCHD—here called NXCAM, Sony’s pro nickname for AVCHD—into an odd-duck camera the size — and what feels like weight — of a short stack of CD jewel cases piled eight high. SONY NEX-FS100 NXCAM. PHOTO BY DAVID LEITNER. Yes, picking up the FS100, the first thing that strikes you is how light it is: a skin of high-impact plastic over a rigid magnesium skeleton, a mere 2lbs., 4 oz. There is no built-in viewfinder. 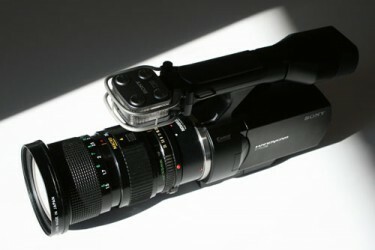 The FS100 steals a page from Sony’s EX3 and latches a light viewing tube to its top-mounted LCD. Long-lasting batteries are the same used in Sony’s Z1, Z5, Z7 series and contribute but a smidgen to the scales. The sensor is a Super 35-size CMOS with 1920 x 1080 pixels, which Sony rates at ISO 800. All HD frame rates are supported, including variable 1-60 fps in 60p mode. The FS100’s 1080/60p mode, incidentally, cracks AVCHD’s 24mbps ceiling, reaching for 28mbps as needed. I don’t know the secret sauce in the FS100’s digital signal processing, but when I shoot at 18db, I don’t see noise. Recording is to Memory Stick or SDHC card (single slot accepts either) and/or a 128GB flash-memory solid-state drive called FMU, which captures over 10 hours at the highest AVCHD rate. What’s more, the FS100 can dual-record, sending identical, redundant files to both Memory Stick/SDHC and FMU at the same time for instant back-up. Although the FS100 lacks HD-SDI output, 8-bit uncompressed HD is nevertheless available via HDMI, and Sony has stretched the HDMI standard to enable either RGB 4:4:4 or component 4:2:2, both with timecode (an HDMI first). 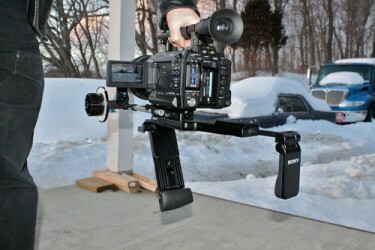 The FMU, the size of a Mini DV jewel box, slots into FS100’s side beneath the handgrip. Like Panasonic’s AF100, the handgrip can come off, as well as the top handle and mic holder, revealing useful 1/4-20 threaded holes. Turn the FS100 over and you find a riot of additional holes, six 1/4-20s and two 3/8-inch. Having used Nikon, Sony E-mount and Alpha lenses on this camera, I’m partial to Zeiss Alpha lenses and Picture Profiles 5 & 6, which mimic telecine transfers of color negative and color print respectively. Sneak-peeked à la Panasonic’s AF100 a year ago at NAB, this beefy camcorder (like a Handycam on steroids) finally showed up in February and has since taken off like a rocket. Featuring the same Super 35 CMOS sensor as the NEX-FS100 (true), it incorporates signal processing from its CineAlta big sisters, the F23 and F35, and 35mbps MPEG-2 recording to SxS cards from little sister, XDCAM EX. Uncompressed 10-bit 4:2:2 HD, up to 60p, is available from Dual Link HD-SDI connectors at the rear. Physically, the F3 is a welterweight, with a body slightly more than 5 pounds. It takes the same small batteries as the EX1 and EX3 and can operate three hours on a charge. PL and other mounts are attached using the wide breech-lock mount borrowed from Sony’s EX3 (larger throat than BNCR or Panavision). Interestingly, Sony’s F3 kit lenses, 35mm, 50mm and 85mm — all T/2.0 — despite wide barrels (see photo of me holding camera) are similarly light, making for an unexpectedly light combination, one that can be handheld in front of the body, eye to the viewfinder, like a Handycam longer than expected. These three Sony PL mount primes (more are planned) communicate with the F3 in sending f/stop and focus information to the viewfinder like a smaller camcorder would. Hosting two sets of gold contacts in its PL mount, the F3 also supports Cooke’s /i Technology and ARRI’s similar LDS technology for displaying and recording lens metadata. SONY F3. PHOTO BY STEVEN ROBINSON. The F3 is intended as a platform for future developments. At present it can send uncompressed 4:2:2 via HD-SDI to a Sony HDCAM SR recorder; soon Sony will introduce an onboard 1TB solid-state drive the size on an iPhone that can replace the HDCAM SR recorder. F3 firmware upgrades obtained via the Internet will extend the F3’s value, for instance, soon adding 10-bit RGB 4:4:4 and S-LOG output (at a price north of $3K). And the F3’s unique 3D-LINK option, when activated, will permit two F3s connected by a 10-pin cable to be operated in exact synchrony by a single remote control. Like the coming of the messiah, predicted each year. At least since first announced at NAB 2008. Without revisiting the sordid details, including boasts, technical woes, and long silences, suffice it to say, at long last, that hand-assembled 5K Epics, reportedly thirty of them, are on hand in New Zealand for Peter Jackson and New Line Cinema’s $500 million, two-film 3D production of The Hobbit, which began March 20th. For us mere mortals, RED’s website says “coming soon,” with no pricing or availability. However it’s been reported that a hundred pre-production Epic-M kits are being made available to early adopters, a $58K package that includes a titanium PL mount, small new RED Bomb viewfinder, 5-in. LCD touchscreen monitor, REDMOTE wireless controller, and four 128GB REDMAG solid-state drives (about 30 minutes each of compressed 5K). If you’re not a RED fanboy, you’re likely unaware that Epic is the size and shape of a Mamiya medium-format camera, a virtual Transformer toy with countless modular attachments, which RED intends as a future platform for larger sensor sizes and resolutions. The first iteration, the one Jackson is using, contains a 30mm x 15mm “14 Megapixel Mysterium-X” CMOS sensor with native 2:1 aspect ratio and frame rate up to 120 fps. Did I mention Epic was conceived both as a still and motion picture camera? Not to worry. RED, which trail-blazed 4K capture, will not be throwing away lines of detail. In fact Epic introduces a High Dynamic Range trick found also in ARRI’s Alexa (below), in which a second, very fast exposure is captured after each ordinary frame. Due to the brevity of exposure, 2-6 six stops of additional highlight detail are restored when the normal and fast-exposure frames are joined later in post. RED EPIC. PHOTO BY DAVID LEITNER. I suspect Jackson will use a Super 35-sized portion of Epic’s sensor for basic 4K production and the full sensor for plates and effects. Come to think of it, that could turn out to be the whole movie. I stand by this insight. 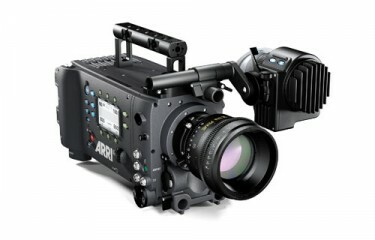 The past six months have borne out the superiority of ARRI’s third-generation digital cinema camera, which ingeniously combines an ALEV III Super 35 CMOS sensor for true 3.5K oversampling of 2K, direct recording of Apple ProRes 422 or 4444 to Sony SxS cards and single or dual-link HD-SDI output of uncompressed HD or RAW. Scorsese liked Alexa’s look so much, he used two of them in last year’s London production of Hugo Cabret, shot in 3D by Robert Richardson. Like Epic, Aaton’s digital debut is years in the making. But with a storied history of genius camera design, never count out Aaton. They think differently. At NAB this year Aaton unveils a production model of Delta-Penelope — a Penelope 35mm film camera with its cassette-style film magazine replaced by a Delta “digital back.” Built into the digital back are a Super 35 Dalsa CCD for “beyond 4K” picture detail and a slide-in DeltaPack (four solid-state drives joined together) for storing uncompressed 16-bit RAW. Uncompressed 4:2:2 and 4:4:4 HD are on tap via HD-SDI, while QuickTime HD proxies for editing are written to an SDHC card. Unique to this design are retention of Penelope’s optical viewfinder and famous ergonomics, a four-second boot up, 3-6 hours power on twin Li-ion batteries and a body that can be switched between 35mm color negative and RAW DPX files. One more thing: no menu trees. For some owner-operators, justification alone for the high lust factor. Not a product, not yet. Perhaps this camera doesn’t belong here — not widely available this year — but I have seen a functioning version in Sony’s R&D labs in Atsugi, Japan, and it loudly signals the future. No line skipping here either, just real-time de-Bayering and subsampling to enable instantaneous 4K output and display. Something to redeem those thousands of Sony 4K SXRD projectors already installed in U.S. commercial theaters? Sony will soon market an 8K CineAlta camera along with HDCAM SR decks, large-capacity solid-state drives and 4K LCD monitors as “Sony Digital Cinema 4K.” Consumer 4K cameras will inevitably follow. You heard it here first. The take-away from this imminent flood of large-sensor cameras? 1) Super 35 is the common image size. 2) A combined universe of cine and SLR lenses awaits us. 3) Low noise and vastly superior low-light performance is the norm, regardless of price. 4) F-stops of 11, 16, 22 are no longer illegal. No longer pinholes to be avoided when using 2/3-inch or smaller sensors. Lens iris openings for the Super 35 format are wider in diameter, all but eliminating softening from diffraction. Exciting developments that will surely transform the look of independent films to come.